A game with a single objective sounds, well, a bit short – just escape Tarkov, right? But things aren’t so simple in this MMO-FPS about a war-wracked eastern European city. Here, try some really excellent MMOs. To have a chance of escaping successfully you’ll need to bunker down, build up supplies, and gain strength. And you’re going to want to do that at The Hideout, a new feature coming to the game’s open beta. The Hideout will initially take the form of an abandoned bomb shelter, which you’ll clean out and fit with new modules: a power generator, water collection system, medical facilities, bathroom, and the like. As the building is upgraded, so too will be your health, hydration and energy regeneration stats, as well as your capacity to stock up on ammo and items. Beyond that, elite modules will allow you to dramatically improve security, speed up skill levelling, craft unique items and resources, and make the bunker a cozy place to be. It’s basically a big house for new progression systems, from the sound of it. 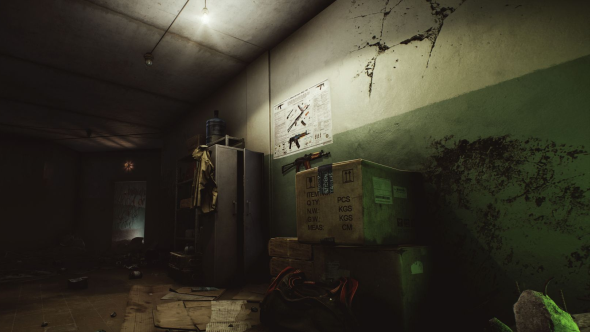 Battlestate Games say that Hideouts are being developed in parallel with the main thrust of development, and won’t slow Tarkov’s progress towards open beta in autumn 2017.